George and I recently completed the Sierra Club Wilderness Travel Course. The dedicated instructors and staff taught us all about snowshoeing, snow camping, rock scrambling, wilderness first aid, and having a great time in the backcountry. Last weekend, we had an opportunity to reciprocate by taking Caroline Lee, one of the staff members, on an airplane camping trip to the Idaho and Montana backcountry. An avid hiker, climber, camper, and backpacker, Caroline had never been airplane camping, although she did like to fly with me. (See the Fight Plan section of the May/June 2013 issue for a description of her first airplane flight over the Sierra Nevada mountains). 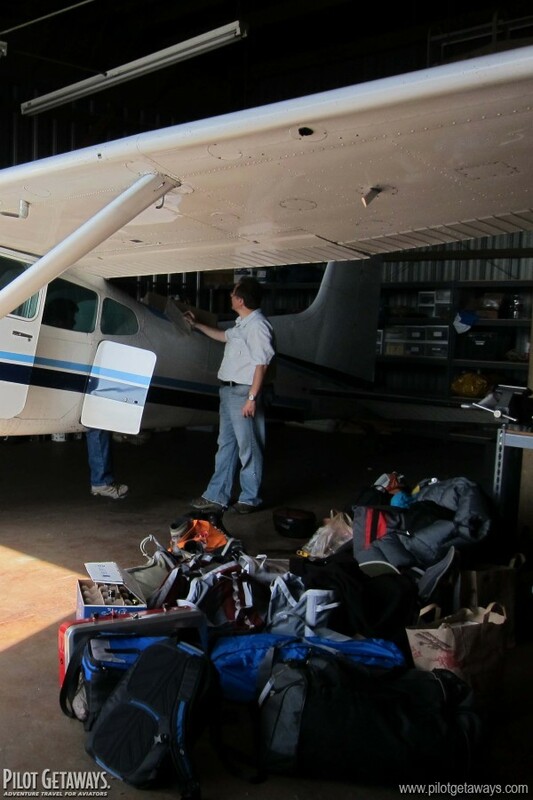 Normally used to backpacking, we reveled in the luxury of being able to carry more weight in my Cessna 185. We took our big tent, a two-burner stove, laptop computer, and even the kitchen sink—literally (we had Sea to Summit Kitchen Sink with us). When we stacked the daunting pile of gear next to the airplane, we feared we may have gone too far. The loading process entailed weighing each item and paring the gear down until we achieved a maximum weight of precisely 3,358 pounds. My Cessna 185 has a gross weight of 3,350 pounds, but there is a 1.4-gallon (8.4-pound) allowance for engine start and taxi, so we even had 0.4 pounds to spare! The heavy weight tamed my normally powerful airplane, and it took some time to climb out of the Los Angeles Basin. Direct northbound departures past 5,711-foot Mount Wilson are usually possible, but this time we had to parallel the mountains and detour west while the 300-hp engine worked hard to lift us out of the warm air. Our route took us across the Mojave Desert and Edwards Air Force Base. Below us, the enormous runways painted on the bed of Rogers Dry Lake told the story of their former use for Space Shuttle landings. [The Aerospace Trail, which includes several famous area landmarks representing our quest to break the sound barrier and conquer space, including Edwards Air Force Base was covered in our Fall 2000 issue.] Farther north, our route on the west side of Death Valley allowed us to simultaneously see the highest point in the Lower 48 states, Mount Whitney, at 14,505 feet to our west, and the lowest point in North America, Badwater Basin at 282 feet below sea level in Death Valley National Park. The snow-capped peaks of the Sierra Nevada contrasted with the stark desert landscape, demonstrating the diversity of scenery in California flying. Farther north, the Ubehebe Crater is a half-mile-wide, more-than-500-foot-deep crater that is like an upside down volcano. Our original destination was Mountain Home Municipal Airport in Idaho, where there is a self-serve fuel pump and a small, grassy airport campground next to the tiedowns. It would be a convenient place for an evening barbecue before continuing to the backcountry the next morning. But the weighing, sorting, and packing of our gear took hours, which put us at Battle Mountain, Nevada, as it was getting dark. A check the friendly folks at Harless Aircraft Services hooked us up with a free tiedown, a courtesy car, and affordable 100LL fuel for an overnight stop. If slot machines aren't your thing, there's not much entertainment in Battle Mountain, but we were able to talk the owner of the Ming Dynasty restaurant to stay open an extra half hour and feed us Chinese food. Click here to read about day 2 of this adventure.